Third Time a Charm? Ho-LEE Crap! Cliff Lee is hoping that the third time for rehab is a charm; more likely, it will be three strikes and he is out. Lee has had a torn common flexor tendon since last May, although prior reports on that called it a “strain,” which I am guessing was never the case. Tears generally do not heal themselves; it can happen, but it is highly unlikely, especially on the elbow. So this third attempt at rehab is probably a waste of time and energy. I feel bad for Lee. He obviously wants to pitch again, but then why did he not have the surgery in the first place? He at least could have been ready for this year. Now, that chance is gone. Of course, no one wants to have surgery, so I understand to some extent. I guess there is no right or wrong answer, but personally, I’d have had it fixed last year. I was there for Lee’s first pitch as a Phillie on 7/31/09 in San Francisco. And now it looks like I may have seen his last pitch. I suppose a miracle could occur, but I am not holding my breath. It is a very sad day. Not that I expect the Phillies to do very well this year, but at least Lee was entertaining to watch. He gave fans something to look forward to on an otherwise bland and rebuilding team. So who is left to pitch besides Cole Hamels and Jerome Williams? The newly signed Aaron Harang has back issues, so I am not optimistic about him. And Miguel Alfredo Gonzalez is looking like a $12 million dollar bust. He has a nice fastball, but lacks control. Speed is of no use if he doesn’t know how to use it. I am rooting for Chad Billingsley to make the rotation in late April, but coming off two elbow surgeries, there is no telling what will happen. 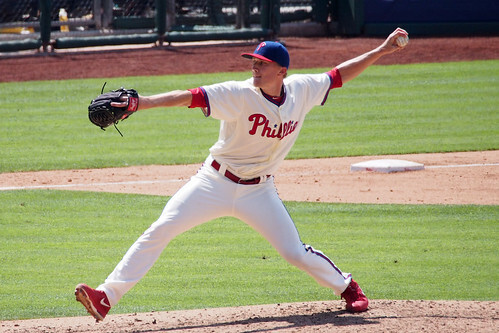 There are a lot of young arms like David Buchanan and Jonathan Pettibone who may make the cut. Now we just wait and see. 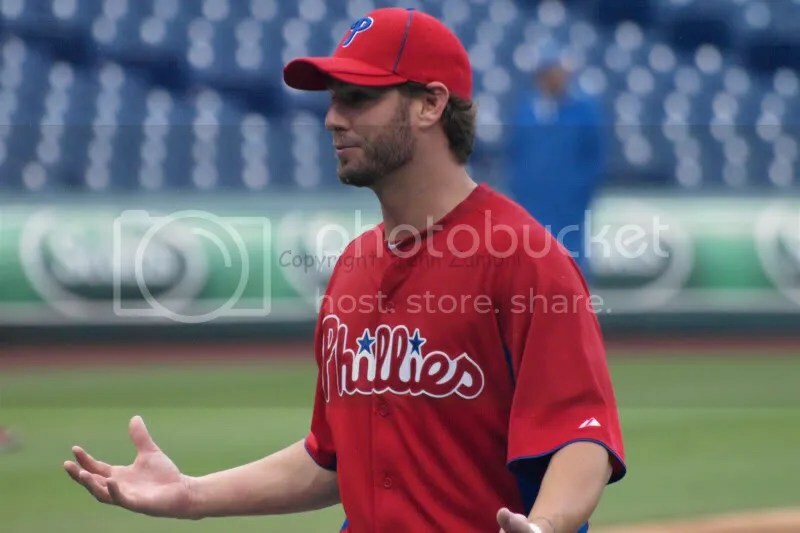 In the meantime, I wish Cliff Lee the best and hope he will get his miracle. After a devastating loss on Wednesday, the Phillies have bounced back in the next series, winning their first 2 games against the Cubs. 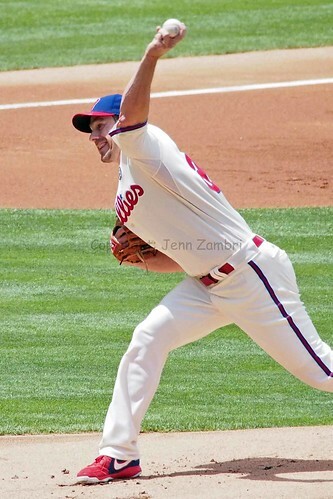 Friday’s game was a 7-2 score and today they won 2-0 as Cliff Lee stunned the Cubbies. Lee was able to lower his horrible 14.40 Opening Day ERA to only 6.00 with this 7 inning effort. 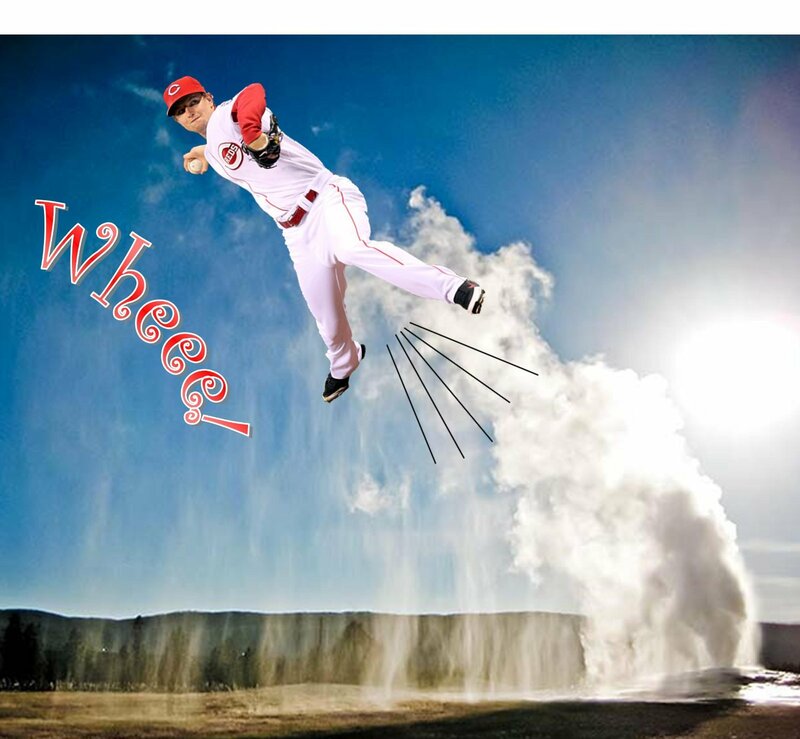 So all is well again with the Phillies ace…yeah! And the offense is not too shabby to start the season. 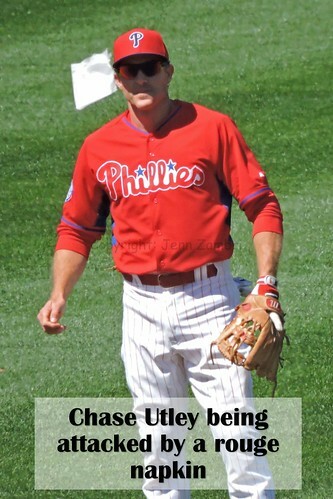 Chase Utley is absolutely on fire after a very slow Spring Training. In the last 2 games, Utley has 5 hits and 4 RBI including 2 home runs. He also hit his 300th career double today and ended the game just a triple shy of the cycle. Domonic Brown has also come to life with 4 hits, 2 walks and 3 RBI in these 2 games, plus ZERO strikeouts. Nada. That alone tells me he is in the zone. Another interesting note is that we are learning some things about the Phillies manager, Ryne Sandberg, early in the season. First, he is totally in love with Jake Diekman. Diekman has pitched in 4 out of 5 games so far this season while fellow reliever Brad Lincoln has yet to throw a pitch. Justin DeFratus has pitched 1 inning and Jeff Manship has thrown exactly 2 pitches total. We have also learned that Sandberg is not totally sold on Roberto Hernandez. In Friday’s game, Hernandez appeared to be cruising in the 6th inning when, after one out was recorded, Sandberg pulled him and put in Diekman. Hernandez had given up 2 runs in the first 5 innings, but his pitch count was low (73). That was a weird move. One last thing I like to mention about today’s game…Jonathan Papelbon saved a game! Miracles never cease! Yes, that comment is dripping with sarcasm. When he saves 3 or 4 in a row with minimal drama, I will curb my smart remarks. Until then, congrats Pap! You live to fight another day! 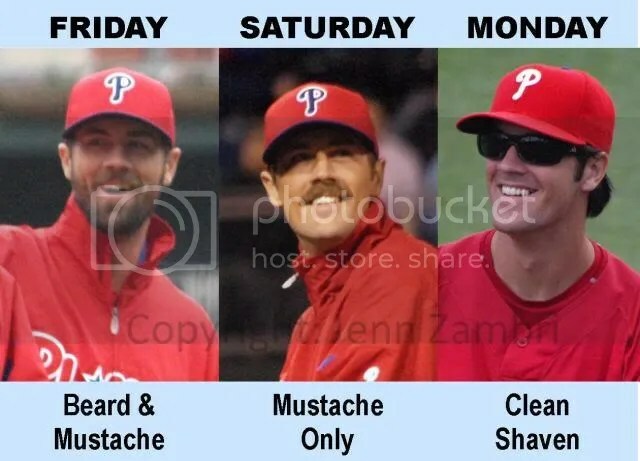 Can the Phillies sweep this series? Hope so! Game 3 is Sunday at 2:20pm and A.J. Burnett will pitch. 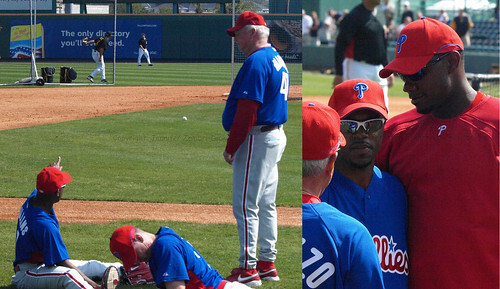 I am sure most of us have heard about the Jimmy Rollins – Ryne Sandberg drama at Spring Training this week. To recap very quickly, J-Roll was being J-Roll and let fly a “Who cares?” when asked about the team’s offense. And then Sandberg let fly a telling, “No comment” when asked about Jimmy bringing positive energy to the club. Rollins was benched for 3 straight days (Mon.-Wed.) without having spoken to Sandberg until Thursday. Before I offer my thoughts on the situation, I will tell you a little story from Spring Training 2009. I make it a habit to arrive to all games, even Spring Training games, many hours early. That is when some of the most entertaining and interesting things happen. Before one 2009 spring game in Bradenton, FL against the Pirates, I witnessed some real J-Roll being J-Roll behavior. As the team was stretching on the field, manager Charlie Manual was pacing about, looking annoyed. And one player was noticeably absent from the field: Jimmy Rollins. About 20 minutes into this, Rollins suddenly appeared jogging across the field. When the team noticed him, everyone, mid-stretch, stopped what they were doing and began clapping and cheering for Rollins as he approached. It was group sarcasm, although in good fun, to congratulate Rollins for finally showing up. As I was right up against the fence where they were stretching, I saw and hear nearly everything that happened next. Manual sauntered over to Rollins with his irritated, head-tilted, almost twitchy swagger that we have seen many time over the years. Usually you saw this when Manual was about to confront an umpire. As Manual berated Rollins, wagging finger and all, Rollins slouched over like a 5 year old getting yelled at for stealing a cookie. He even pouted. Rollins then made various hand gestures to explain how he got stuck in traffic and then got turned around, etc… A lot veteran players these days don’t like taking the team bus to spring away games, so it was not too unusual that Rollins drove himself. Still, everyone else was on-time. Ryan Howard then wandered over and put his arm around Rollins to comfort him, again, like a 5 year old whimpering after being punished. Manual just kept talking. It was very clear that this was not the first time Rollins broke the rules. And as we all know, it would not be the last. But under Manual, Rollins got used to being “scolded” and then simply going about his business after some comforting words from a few teammates. This has been a decade-long pattern. So does it really surprise anyone that in this most recent incident Sandberg decided to give Rollins the silent treatment? When you were a kid, what was worse? Getting yelled at or being ignored and having to wonder what you did wrong? The silent treatment doesn’t work on everyone; however, I am sure Sandberg felt like at the very least, he needed to try something different than what Manual had done. I have heard a lot of criticism of Sandberg the last few days for not speaking to Rollins right away. Personally, I think giving Rollins days to stew over what was going on may have an effect going forward. Although Rollins did nearly hang himself in the media afterwards with comments like, “Well, everyone is allowed to have their own opinion. It doesn’t make it right, but he’s the manager so he gets to have the last say.” I am sure that did not endear him to Sandberg at all. But as the new manager, Sandberg is going to have to think outside the box when dealing with player issues, especially with those players who have become used to a very different style of management. How will J-Roll react now that he and Sandberg have put the issue to rest? Time will tell. In 2012, the Phillies faced Reds pitcher Mike Leake twice and destroyed him to the tune of 13 runs. He had an overall ERA against the Phils of 17.55. Ouch. But last night, this team sprung Leake from his Phillies prison, allowing him to mow them down one hitter after another. Ah, sweet freedom for Mr. Leake. He must be quite relieved this morning. On the exact opposite side, the Phillies probably got little sleep due to nightmares. Some people have nightmares about standing naked in a crowd. The Phillies are probably having nightmares about standing at home plate without a bat. They may as well have been standing there without one if they were never going to use it. And that pretty much describes this entire 6-game road trip which went down in flames after getting swept in 3-games by the Reds. They scored only 10 runs in all 6 games and came away with just 2 wins, both against the Marlins. Granted, it is very, very early in the season. The Phillies have time to make up ground, however, these are very serious issues. At some point, one has to question whether or not this team is capable of more. But we will not really know until we see the whole team together as it was meant to be; that means when Carlos Ruiz returns and we also finally see what Delmon Young has to offer. Ruiz cannot return due to suspension until April 28th. And Young is still on the DL, although he has been participating in extended Spring Training games. To make matters worse, Domonic Brown left the game early with a sore back; he will have an MRI today. And John Lannan, who got pounded for 6 runs in 1.2 innings last night, complained of a sore knee after the game. His status is unknown.